‘The Lindbergh Line’ is something of a blast from the past, and the company’s glory days stretch back decades. 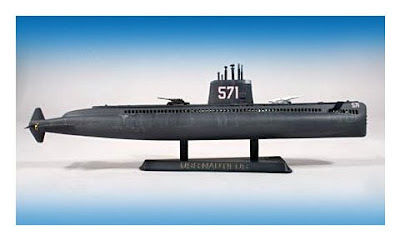 However, Lindbergh is still alive and kicking, under the ownership of J Lloyd International Inc.
And one of Lindbergh’s kits is worth highlighting right now, as today's the day in 1958 that the USS Nautilus nuclear submarine passed safely under the North Pole. This passage was epoch-making in its time, as the Nautilus was the first sub to be able to submerge for long periods - before this, subs needed to surface frequently for air. The under-the-ice journey was also a navigation triumph, for conventional compasses don’t work near the Poles, and a specially developed Sperry gyroscope was used for dead-reckoning. If all else failed, the sub would have fired torpedoes to blast its way through the ice! A same-day cover stamp was issued at the time (top picture). The Lindbergh kit (middle) scales out to a length of some 305 mm (12 in), making it about 1:320 scale, though Lindbergh’s site reckons it to be variously 1:240 or 1:300. Take your pick - this is a kit dating back to the ‘fit the box’ era after all. It differs from the rival Revell kit in some ways - the Revell Nautilus featured a deck-housing for an early type of cruise missile called the Loon - interesting to look at, but the real submarine never had one. 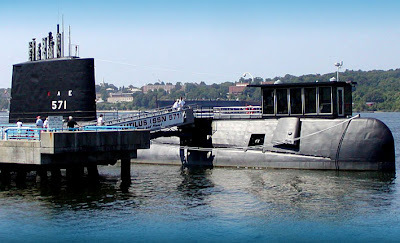 USS Nautilus became a museum piece after decommissioning (bottom), and you can go inside the boat at the Submarine Force Library & Museum, in Groton, Connecticut. There are celebrations there today to mark the 51st anniversary of the North Pole voyage - amongst other temptations, visitors are invited to build a LEGO submarine. Visit the Submarine Force Library & Museum here. You can buy the Lindbergh kit at a closeout price of $9.95 USD from online supplier MegaHobby, here.